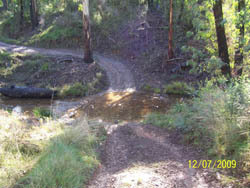 This track branches off from Donnelly\'s Creek Track. If coming from Merringtons camp, you will traverse most of Donnelly\'s Creek Track before getting to Army. From Donnelly\'s Creek Entrance, the initial climb is very steep, with loose rocks and sharp slate rock steps. Near the top of the first climb there are also some decent ruts that need care to navigate. After this, thare are a lot of steep climbs/decents with some very deep culverts, with several switchbacks to contend with. These switchbacks cannot be raced into, and care, not speed, should be used for the turns as they trun away from the wall face, and it could be a long way down!!! There is one little creek crossing at the bottom, bit nothing to worry about, maybe a bottom of the rim depth. This track can be challenging, and fun, but care should always be taken. A vehicle with low range, good clearance and tyres should be considered for a track of this type.